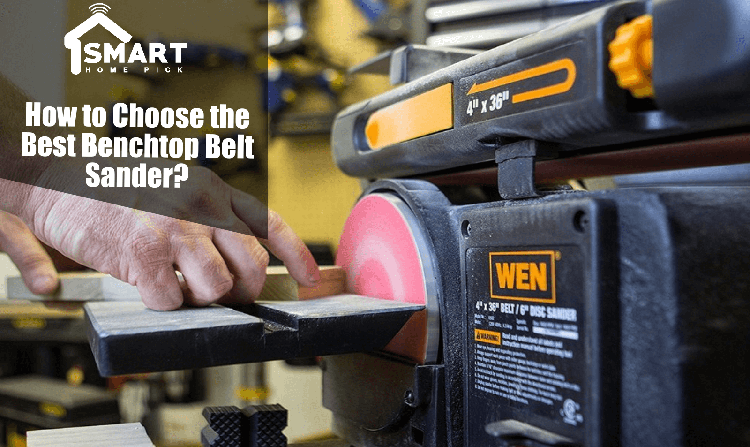 How to Choose the Best Benchtop Belt Sander? | 3 Steps! Home » Resources » How to Choose the Best Benchtop Belt Sander? Now if you are a do-it yourself or a professional when it comes to sanding, you did agree it is best to have a strong, durable and efficient machine in helping you achieve that sanding perfection you so much yearn for. One would also agree that the best machine or equipment for larger sanding projects and more power for a perfect sanding finish will be only through the use of a Benchtop Belt sander. Commonly known for their high efficiency in power, the Benchtop Belt Sander is also the most versatile sander with a belt and a disc built in to it. However, the question here is how to choose the Best Benchtop Belt Sander. There are indeed a few things one should know before making the attempt of acquiring a benchtop belt sander as said before this particular equipment could be classified as a heavy-duty equipment. In-fact benchtop sanders are for heavier duty works, have more power and have lager surface area for faster completion. Due to the different types of models in the market now, it can get one confused on which is the best. Below are a few tips on helping you choose the best benchtop belt sander. One of the first things to look out for in a benchtop belt sander will be its adjustability of the belts. You should always make sure it can be tilted to your project specifications as this intends to increase flexibility in the rounding edges and other detailed work. It will be advisable to go in for a benchtop belt sander that has the ability to tilt at any different angle from 0-90 degrees. This find of feature in your sander will allow for a more comfortable grip and also let you be able to reach corners and under sides of your project. Another interesting factor to consider when making a choose for your benchtop belt sander will be its base. Most of them comes with different types of bases so as to proved support and weight for the machine, but it would be best if one made use of a base with a cast iron base as it prevents heavy vibrations making the tool safer and more comfortable in the usage. Well you can’t get a good benchtop without checking for how much power it has. Most of the benchtop belt sanders power are determined by the size of their motors and its power is measured by the RPMs. Thereby the higher number of RPPMs will definitely mean you did be getting a strong and aggressive sanding job done and vice versa, having a less RPMs will be only used for working on smaller projects. Another important thing to put highly in consideration will be checking the tension release lever. Lever provides a great amount of simple changes to sandpaper grit, and makes sure you are comfortable and convenient in using the machine. Now since most powerful sanders do have large motors, finding a balance between the two will only be determined by how and when the sander will be used. Most of these Benchtop belt sanders come in both freestanding unit and a tale top unit. For home owners the table top is the one to make use off for more power and versatility. So, one may ask then, which benchtop belt sander is the best at the moment in the market. Besides the above-mentioned points and the fact of individual preference which does play a great amount of role in the choosing of your benchtop belt sander, we did recommend the WEN 6502 as the top of the class benchtop belt sander. How to Keep Sanding Belt Clean?